Sometimes a large backpack isn’t the best choice for a hunting expedition. Sometimes a hunter wants simplicity blended with reliability. And all hunters go through this feeling at some point in their hunting life. When these pangs start to hit, the only course of action is to get a backpack that will effortlessly handle a short hunting trip of a day or less. However, one thing remains universal, that’s the ability of the pack to bear all the necessary gear that the hunter wants to carry. So, you might be considering that this is an oxymoron. A compact backpack can’t possibly have enough room to carry all you need, right? Wrong. The Alps Outdoor Z Dark Timber Daypack is the perfect pack for those who are looking for a pack to complement their bigger hunting daypack. It’s everything one would need in a daypack and more. And as you’ll find out in this ALPS OutdoorZ Dark Timber Day Pack Review, this isn’t a pack to overlook if you’re serious about owning a good one. You can easily be fooled when looking at the Dark Timber pack, that it hasn’t got enough room for all your gear. But don’t be so quick to judge. Within the compact body are a large front accessory pocket and an ample sized main pocket that’s accessible from the top. On the lower side, there’s a slightly smaller storage pocket. Then, to the sides, there are mesh pockets that enable you to carry extra gear. This adds up to a total of 2285 cubic inches of carrying capacity. Weighing in at only 2 pounds when empty, you shouldn’t have to worry about any extra weight coming from the pack itself. All its weight will come from the gear. But the internal storage isn’t all the ALPS Dark Timber has up its sleeve. When you’ve packed it to capacity and nothing more can go in you’ll still be able to attach extra gear on the outside. Glancing at the front face of the pack, you’ll notice a bar-tacked webbing. This, together with the lashing straps allow one to attach extra gear on the outside. If you’re carrying an item that won’t fit inside the pack, the external lashing system will securely hold them in place. There’s no need of worrying about leaving any of your gear behind. With a compact and lightweight pack, you’ll still have the capacity to carry more than enough for your trip. With all that the pack can carry, the next thing you’ll probably worry about is a comfort. Are you able to carry it without feeling the strain? Is it going to be friendly to your back and shoulders? The answer to these questions is yes. Alps OutdoorZ included compression straps in this daypack. What the straps do is that they pull the weight of the pack towards your body, raising the center of gravity and consequently relieving your shoulders from bearing the massive weight. Combine this with the adjustable sternum strap and the padded waist belt and shoulder straps and you have a pack that will comfortably lay on your back and allows you to go further. We know that the great outdoors can transform from a friendly host to a harsh antagonist. Both the hunter and his pack need to be ready to face the unpredictability of nature. Having a pack that can handle these vagaries makes all the difference. Made of the Brushed Realtree Xtra HD fabric, the Dark Timber best hunting day pack inherits the hard-wearing qualities of this material. It’s a tough, scratch resistant fabric that handles the harsh outdoors with gusto. On top of that, this fabric has a water-resistant quality that ensures that a light shower won’t ruin your gear within it. These qualities make for a pack that will steadfastly accompany you without uttering a complaint. Alps OutdoorZ didn’t forget a feature that is one of the most important in any pack; hydration compatibility. When the pangs of thirst strike, you’ll need a source of water. Being hydration compatible means that you can insert into the pack a reservoir and attach a compatible hydration bladder. With these, you’ll get a constant supply of water throughout your journey. Still, the side mesh pockets on the pack can accommodate water bottles in case you need more water than the hydration pouches can carry. The pack is light weight and compact. With a weight of just 2 pounds, it only gets its heft from the load packed in it. This pack has spacious pockets that provide a carrying capacity of 2285 cubic inches. Larger gear can be strapped on the exterior thanks to the lashing straps available. 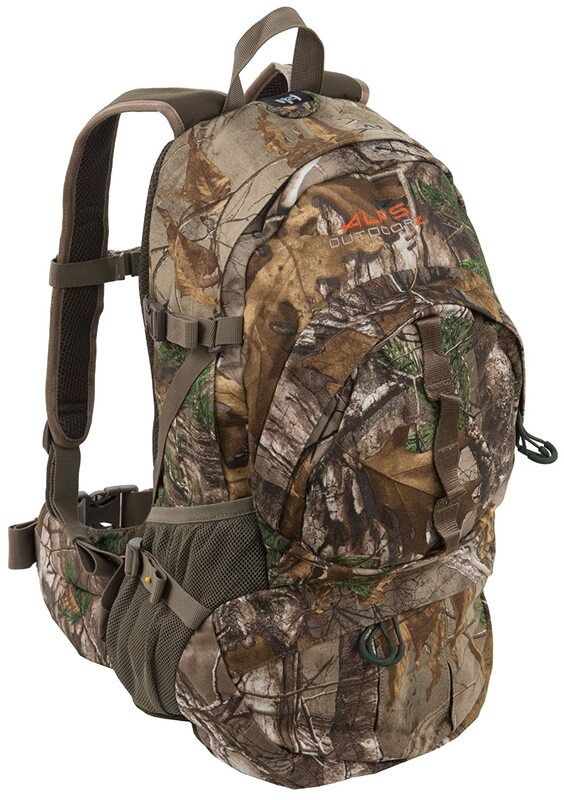 The Outdoor Z Dark Timber has a padded waist belt and shoulder straps that provide comfort while carrying. To ease carrying the load, the compression straps are used to move the weight closer to the carrier’s body. The adjustable sternum straps make the pack ideal for people of different body sizes. Made of the Brushed Realtree Xtra HD fabric, the pack is highly resistant to the harsh outdoor environment. It is also H2O compatible making it easy to insert a hydration reservoir and bladder to keep you supplied with water while on the move. The side mesh pockets aren’t very strong. The pack is only water resistant to a certain level. Excessive water seeps into the pack. Q: Is the pack water proof? A: No it isn’t. It’s only water resistant to some degree of water. Q: How long of warranty does one get on purchase? A: ALPs Outdoor Z gives a lifetime warranty with all their packs. Q: What other color options are there? 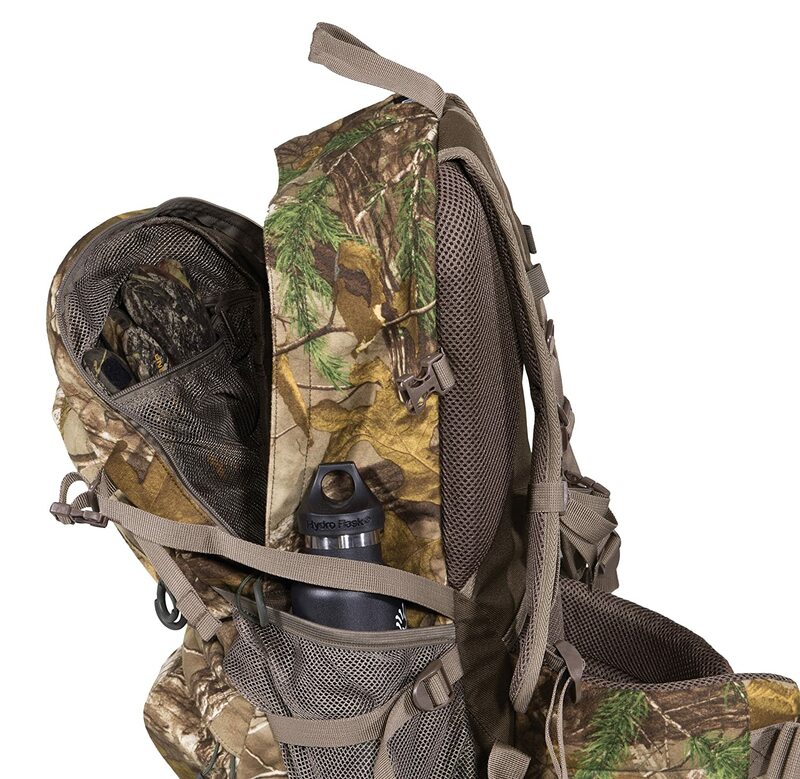 A: Aside from the Realtree Xtra, you also get a Mossy Oak Country option. Q: What’s the carrying capacity of liters? A: It’s about 37 liters. Q: What are the dimensions of it? A: It measures 20 inches in height by 12 inches in width by a depth of about 4 inches. So there you have it. The Dark Timber day pack makes a good case for itself. It’s the perfect pack to carry on your day trip. Perhaps you’re camping and need a backpack to carry when exploring away from the campsite. This is the one for you. It’s got enough space to take in all your gear, and it’s comfortable enough to carry even when filled to the brim. The best part is, the Dark Timber is durable enough to withstand the punishment of an outdoor lifestyle. So we end this ALPS OutdoorZ Dark Timber Day Pack Review by giving the pack two thumbs up.